After all Navi Pillay had been playing games previously too, for during the Special Session, which she did not attend in person, she sent a video message which was a barely veiled demand that we be hung out to dry. In this she was obviously adopting the approach of David Miliband that the Special Session had been summoned to indict us for War Crimes. He made this clear in a statement in the House of Commons, whereas his charming young envoy in Sri Lanka was trying to convince me that the main reason Britain had been so anxious to have a Special Session was to ensure that we treated the Displaced Persons well. Fortunately the Americans pinned Miliband down as to what his real motives were, and Wikileaks have now put this on record. Unfortunately the media, which continues to crucify Pakistan about what is seen as ambiguity in fighting terror, pays no attention to the clear evidence that David Miliband, with an evil cynicism that surely requires explication, was lending covert support to terrorism so that he could achieve electoral success. Now, given the dance of death some of his acolytes such as Joan Ryan are engaging in with one of the less restrained of the successors to the LTTE, what were earlier presented as humanitarian concerns have been forgotten. We resettled the displaced very quickly, after rapid demining, but there has been not a word of regret for earlier misrepresentations, let alone congratulations for a job well done, except from those who helped us unreservedly, such as former UN Resident Coordinator Neil Buhne. But, albeit with continuing misrepresentation internationally about our relations with the UN in Sri Lanka, misrepresentation that sadly the UN in Sri Lanka feels unable to counter for what I suppose are understandable reasons, the focus of criticism has shifted again to the first love of those who dislike our success, namely charges of war crimes. It is noticeable that Navi Pillay led the charge on this earlier too, when the UN in Sri Lanka behaved in a more responsible fashion. This has led to attacks on them, and I fear that, unless they actually defend themselves more actively, the careers of those who worked so effectively here for our fellow Sri Lankans will be blighted beyond repair in the venom being poured out against them. 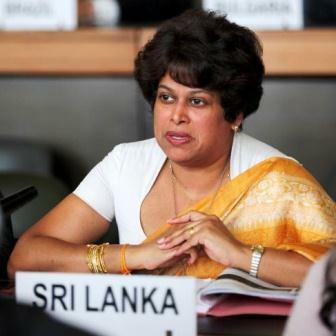 Thus, while noting that Navi Pillay publicly stated on 13 March 2009 ‘that 2,800 civilians may have been killed and more than 7,000 injured since 20 January’, the Darusman Panel accuses the UN in Sri Lanka of suppressing information. Indeed it goes so far as to claim that ‘the Human Rights Council may have been acting on incomplete information when it passed its May 2009 resolution on Sri Lanka.’, which translated means that the Council believed what Sri Lanka said, with evidence and statistics, rather than Navi Pillay’s emotional outburst, citing figures that the UN in Sri Lanka had told her were suspect. The problem with Navi Pillay is that she began her stint with an agenda, which no facts could change. Indeed she did not bother about facts. Had she checked for instance on the ICRC figures for casualties at the time of her March outburst, she would have known that the ICRC had, with assistance from the Sri Lankan navy, brought out to hospitals in the area controlled by the government nearly 3000 wounded and sick and bystanders. Over the next two months they nearly 11,000 more. Of the total figure, according to the ICRC, only 4,500 were injured, with another 2,000 or so being sick. Over 7,000 of those who came out therefore were what is termed bystanders. While it is possible that the LTTE kept the sick behind, and sent out chosen bystanders, these ICRC figures suggest that the number of actual wounded was far less than Navi Pillay was trumpeting. That in turn indicates that the dead, given the usual ratio of wounded to dead, exemplified indeed in her March figures, was much less than that which the Panel now asserts without any diffidence. Unfortunately, with Navi Pillay’s exaggerations being privileged in the Report, and the more careful approach of the UN officials on the ground being ignored, what might be termed the new interventionist approach of the UN is being advanced, with concomitant denigration of the more collegiate approach on which the UN was actually founded. In this regard I believe countries that believe in basic principles of sovereignty, that should be challenged only in the extreme cases agreed by the UN General Assembly with specific authorization from the Security Council, should be careful about the approach adopted by officials like Navi Pillay and her staff. We know for instance that what might be termed the War Crimes Agenda was advanced by her staff, at a meeting organized by the American Ambassador, who did not have the courtesy to even inform the UN Resident Coordinator that she was inviting a member of his staff, let alone seeking his permission. 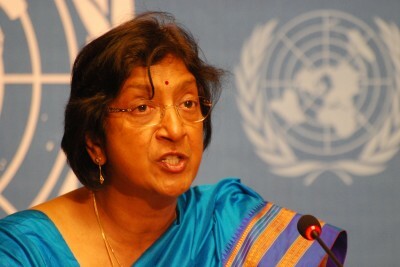 And though it could be argued that Navi Pillay’s representative was too junior to influence opinion, the fact remains that she was described as representing the UN – and it is precisely such junior staff, who see their allegiance as lying elsewhere than the collective imperatives of the UN Country Team on the ground, who can sway international opinion, by their use of the international media, their denigration of their seniors, their adherence to independent agendas. In short, Navi Pillay can be dangerous, like her predecessor Louise Arbour, and like the rest of the regiment of monstrous women who have been sniping at Ban Ki-moon. Two of them are Scandinavian, Mona Jul and Inga-Britt Ahlenius. There is also an element of racism in the attacks on the Secretary-General, as when the dishonesty of a South African, presumably white, since his name was Paul van Essche, led to vicious denigration of a racist sort on the UNDP Watch blogspot, viz ‘Go away now you corrupt Korean’ and ‘Only thing this pig brought from Korea was the best corrupt practices’. The aim of such attacks is pretty transparent, to put the Secretary General on the defensive and thus allow much more control to the heads of other agencies. It is a pity however to see Navi Pillay also playing this game. The background of the majority of officials in her office, as graphically explained to me by the previous Indian ambassador in Geneva, may explain this; but I suspect Navi Pillay’s parents, who strove so hard to give her better opportunities in an unjust world, would be depressed at the manner in which she is now working to the agenda of the privileged who seek not just more privileges, but also authority over those they see as underlings.